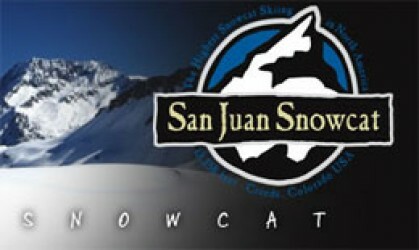 San Juan Snowcat delivers powder filled snowcat skiing and snowboarding adventures traveling in a heated and enclosed snowcat. Imagine yourself and nine other friends in the pristine and remote backcountry setting that Colorado is known. San Juan Snowcat is ideally situated in the premier powder terrain that is sought after by every skier, snowboarder and backcountry enthusiast. We are located in the San Juan Mountains just north of the historic mining town of Creede. Our company soley exists to bring you and your group into the true Colorado Backcountry in search of untracked lines. Just think... No lift lines. No traffic. No crowds. No BS. And free parking too. San Juan Snowcat also conducts scenic snowcat sightseeing tours that will show you up to seven different Colorado "Fourteeners", vast expanses of high altitude terrain with plenty of photo oppurtunites and chances to get out of the snowcat. You will feel as if standing on top of the world. Please ask us how we can make your scenic tour your own. How about pictures of a high altitude sunrise or sunset? San Juan Snowcat can help.